Download "Student Name First Year Student Transfer I.D. Number Change of Major Readmit. 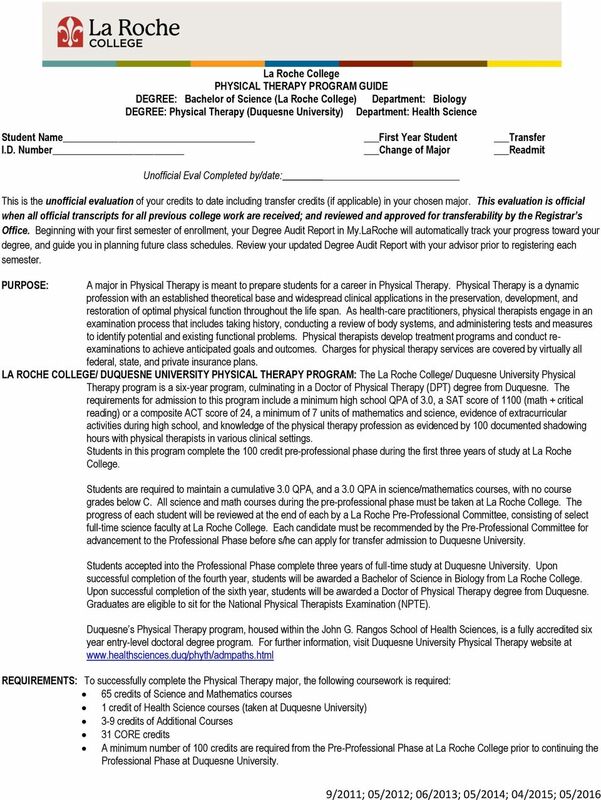 Unofficial Eval Completed by/date:"
1 La Roche College PHYSICAL THERAPY PROGRAM GUIDE DEGREE: Bachelor of Science (La Roche College) Department: Biology DEGREE: Physical Therapy (Duquesne University) Department: Health Science Student Name First Year Student Transfer I.D. Number Change of Major Readmit Unofficial Eval Completed by/date: This is the unofficial evaluation of your credits to date including transfer credits (if applicable) in your chosen major. This evaluation is official when all official transcripts for all previous college work are received; and reviewed and approved for transferability by the Registrar s Office. Beginning with your first semester of enrollment, your Degree Audit Report in My.LaRoche will automatically track your progress toward your degree, and guide you in planning future class schedules. Review your updated Degree Audit Report with your advisor prior to registering each semester. PURPOSE: A major in Physical Therapy is meant to prepare students for a career in Physical Therapy. Physical Therapy is a dynamic profession with an established theoretical base and widespread clinical applications in the preservation, development, and restoration of optimal physical function throughout the life span. As health-care practitioners, physical therapists engage in an examination process that includes taking history, conducting a review of body systems, and administering tests and measures to identify potential and existing functional problems. Physical therapists develop treatment programs and conduct reexaminations to achieve anticipated goals and outcomes. Charges for physical therapy services are covered by virtually all federal, state, and private insurance plans. LA ROCHE COLLEGE/ DUQUESNE UNIVERSITY PHYSICAL THERAPY PROGRAM: The La Roche College/ Duquesne University Physical Therapy program is a six-year program, culminating in a Doctor of Physical Therapy (DPT) degree from Duquesne. 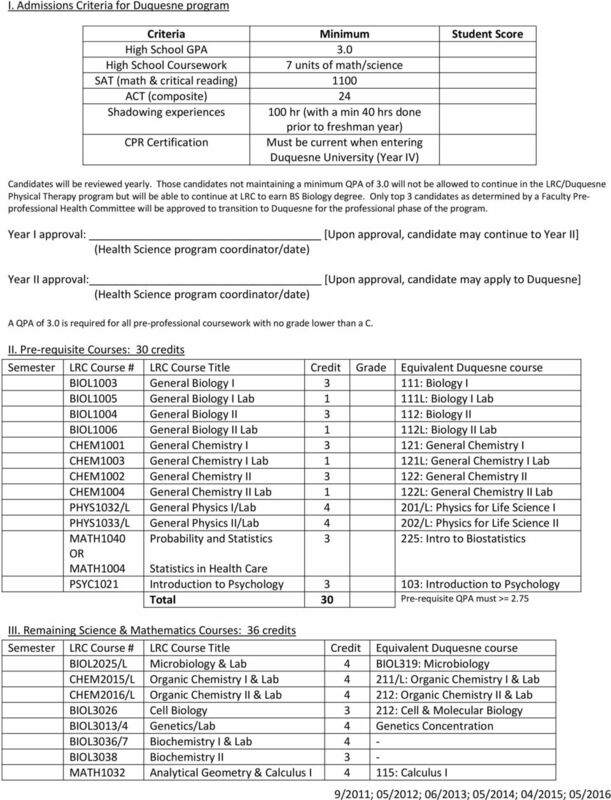 The requirements for admission to this program include a minimum high school QPA of 3.0, a SAT score of 1100 (math + critical reading) or a composite ACT score of 24, a minimum of 7 units of mathematics and science, evidence of extracurricular activities during high school, and knowledge of the physical therapy profession as evidenced by 100 documented shadowing hours with physical therapists in various clinical settings. Students in this program complete the 100 credit pre-professional phase during the first three years of study at La Roche College. Students are required to maintain a cumulative 3.0 QPA, and a 3.0 QPA in science/mathematics courses, with no course grades below C. All science and math courses during the pre-professional phase must be taken at La Roche College. The progress of each student will be reviewed at the end of each by a La Roche Pre-Professional Committee, consisting of select full-time science faculty at La Roche College. Each candidate must be recommended by the Pre-Professional Committee for advancement to the Professional Phase before s/he can apply for transfer admission to Duquesne University. Students accepted into the Professional Phase complete three years of full-time study at Duquesne University. Upon successful completion of the fourth year, students will be awarded a Bachelor of Science in Biology from La Roche College. Upon successful completion of the sixth year, students will be awarded a Doctor of Physical Therapy degree from Duquesne. Graduates are eligible to sit for the National Physical Therapists Examination (NPTE). Duquesne s Physical Therapy program, housed within the John G. Rangos School of Health Sciences, is a fully accredited six year entry-level doctoral degree program. For further information, visit Duquesne University Physical Therapy website at REQUIREMENTS: To successfully complete the Physical Therapy major, the following coursework is required: 65 credits of Science and Mathematics courses 1 credit of Health Science courses (taken at Duquesne University) 3-9 credits of Additional Courses 31 CORE credits A minimum number of 100 credits are required from the Pre-Professional Phase at La Roche College prior to continuing the Professional Phase at Duquesne University. 4 IV. 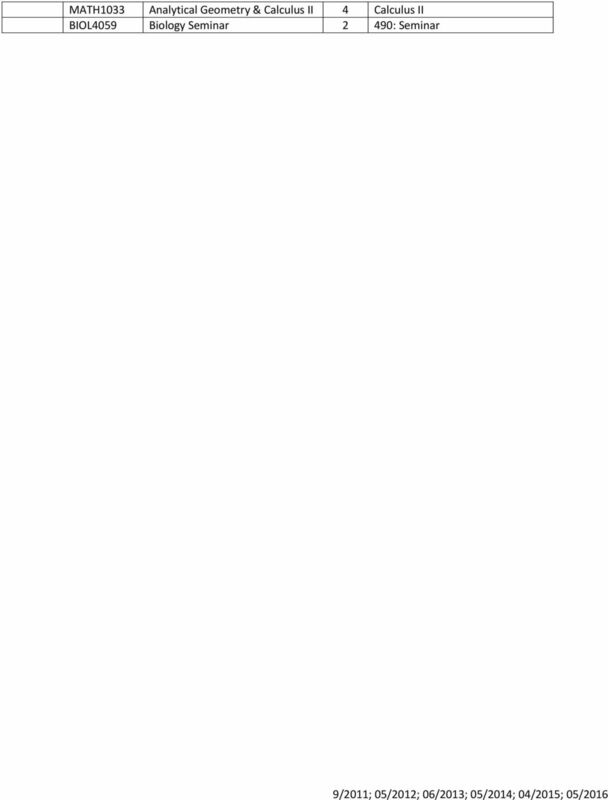 Health Science Course: 1 credit Semester Course # Course Title Comments PHYTH 301 Introduction to Physical 1 This course MUST be taken at Duquesne! 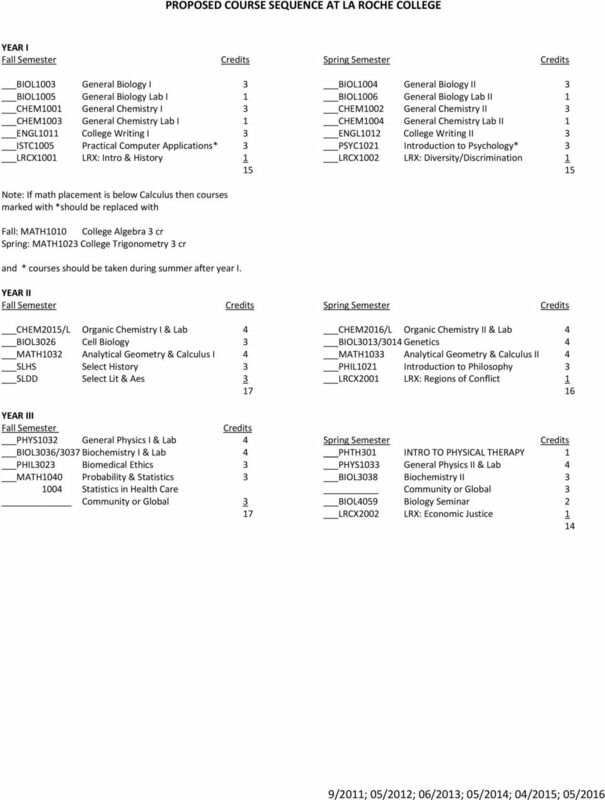 Therapy V. Additional Courses: 3-9 credits Semester LRC Course # LRC Course Title Credit Grade Equivalent Duq course PHIL3027 Biomedical Ethics 3 254: Health Care Ethics MATH1010 College Algebra (if not placed 3 directly into calculus) MATH1023 College Trigonometry (if not had trig in high school) 3 VI. 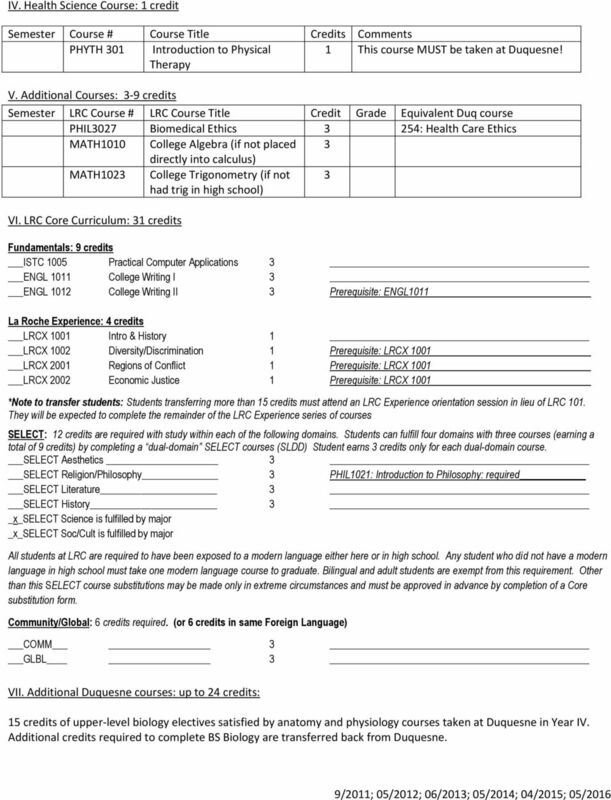 LRC Core Curriculum: 31 credits Fundamentals: 9 credits ISTC 1005 Practical Computer Applications 3 ENGL 1011 College Writing I 3 ENGL 1012 College Writing II 3 Prerequisite: ENGL1011 La Roche Experience: 4 credits LRCX 1001 Intro & History 1 LRCX 1002 Diversity/Discrimination 1 Prerequisite: LRCX 1001 LRCX 2001 Regions of Conflict 1 Prerequisite: LRCX 1001 LRCX 2002 Economic Justice 1 Prerequisite: LRCX 1001 *Note to transfer students: Students transferring more than 15 credits must attend an LRC Experience orientation session in lieu of LRC 101. They will be expected to complete the remainder of the LRC Experience series of courses SELECT: 12 credits are required with study within each of the following domains. Students can fulfill four domains with three courses (earning a total of 9 credits) by completing a dual-domain SELECT courses (SLDD) Student earns 3 credits only for each dual-domain course. SELECT Aesthetics 3 SELECT Religion/Philosophy 3 PHIL1021: Introduction to Philosophy: required SELECT Literature 3 SELECT History 3 x_select Science is fulfilled by major _x_select Soc/Cult is fulfilled by major All students at LRC are required to have been exposed to a modern language either here or in high school. Any student who did not have a modern language in high school must take one modern language course to graduate. Bilingual and adult students are exempt from this requirement. Other than this SELECT course substitutions may be made only in extreme circumstances and must be approved in advance by completion of a Core substitution form. Community/Global: 6 credits required. (or 6 credits in same Foreign Language) COMM 3 GLBL 3 VII. Additional Duquesne courses: up to 24 credits: 15 credits of upper-level biology electives satisfied by anatomy and physiology courses taken at Duquesne in Year IV. Additional credits required to complete BS Biology are transferred back from Duquesne. Application Deadlines are March 1 (priority February 1) for fall acceptance and October 1 (priority September 1) for spring acceptance.